Cheong Wa Dae says South Korea, US long aware of North Korea’s ‘undeclared’ missile bases. With the United States and North Korea deadlocked over denuclearization negotiations since their first summit in Singapore, the prospect of future talks appears to have worsened following a report of what the US suspects to be undeclared missile sites in the North. Beyond Parallel, a team that specializes in North Korea issues at the US-based Center for Strategic and International Studies, said in its report published Monday that it has identified 13 out of an estimated 20 missile operating bases undeclared by North Korea. The report, based on satellite imagery captured in March and extensive interviews with North Korea experts, prompted criticism in Washington that Pyongyang has been “deceptive” about its commitment to abandon nuclear weapons and ballistic missiles. Satellite imagery of Sakkanmol missile operating base. Yonhap. US President Donald Trump said after the Singapore summit that North Korean leader Kim Jong-un pledged complete denuclearization, but there have been mounting concerns in Washington that North Korea might not fulfill its commitment. Citing anonymous intelligence sources and nuclear experts, US media have reported that Pyongyang has continued its work on nuclear and ballistic missile programs at a number of secret bases. The sense of skepticism is expected to increase, as Democrats who took over the House of Representatives are ratcheting up their criticism of Trump’s approach toward North Korea and his idea of holding a second summit with Kim. “President Trump is getting played by Kim Jong Un,” Edward J. Markey, a Democrat of Massachusetts and a member of the Foreign Relations Committee, said in a statement released Monday after the publication of the CSIS report. South Korea’s presidential office tried to downplay the implications of the report on North Korea’s undeclared missile bases, expressing hopes that the reports are not going to undermine President Moon Jae-in’s rapprochement efforts toward the communist state. 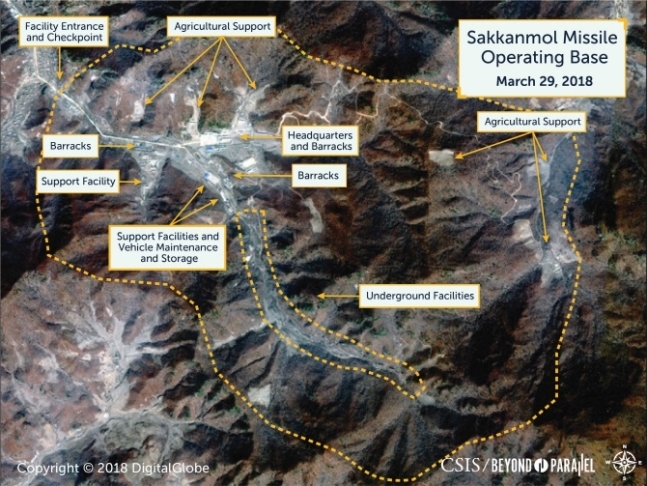 The presidential office said the secret bases at Sakkanmol are designed for short-range ballistic missiles and that the South Korean military has been monitoring the sites closely with the US via military satellites. “North Korea has never made promises to shut down the missile bases, nor has it signed any agreement that obligates the North to shut down the bases,” presidential spokesperson Kim Eui-kyeom said during a press briefing. The Joint Chiefs of Staff said the militaries of South Korea and the US have been closely watching North Korea’s missile bases, including those in Sakkanmol. But the JCS declined to comment on the exact locations under surveillance. North Korea was believed to have launched several short-range missiles from the Sakkanmol base in 2016. The facility is located about 80 kilometers from the heavily fortified Demilitarized Zone that separates the two Koreas.